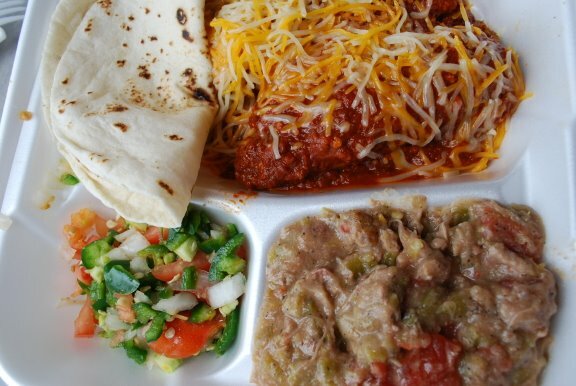 A little shack on NM 518 between Holman and Cleveland, Theresa's Tamales serves the kind of New Mexican food favored by New Mexicans. Chiles are prominent. The Chile Rojo and Chile Verde are radiant and strong. When you've been away from this kind of food for even a little while it can be breathtaking to become reacquainted with it. Both my wife and I got the same plate. Pork Tamales with tortillas, chile verde stew and pico de gallo. Both the red and green chiles are outstanding. This is not the (becoming more common) pedestrian chile one can find in too many NM eateries. The red, in particular, stood out to me as being exceptionally good. The masa surrounding the tamales has an airy quality that is memorable. The pico de gallo was as fresh, sharp and hot as it looks in the photo. Other diners were ordering burritos that could be customized. They looked outstanding and I will be back for these. If you are anywhere near Taos, Chimayo, Las Vegas NM or Santa Fe I'd strongly recommend a visit. Although we certainly have our fair share of good Mexican tamales in Dallas, that plate full of New Mex-Mex tamales and fixuns look scrumptious! I'd order the same plate. Love both New Mexican green and red sauces. I don't have a GPS. I'm gonna dig out my road atlas and stick a pin in Cleveland NM! Drove through Cleveland around Memorial Day last year and drove right past. Will have to schedule a stop next time. That looks soooo good , I need a NM.road trip!!!!!!! Just looked at the map. Guess I'll never eat there. Move your stick pin north a bit on 518. 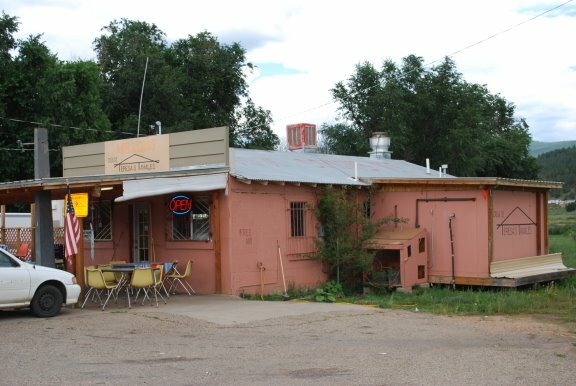 Theresa's is between Holman and Cleveland in a very pretty part of NM. ...and to think I stopped to take some photos along 518 just west of Holman. We've been back several times and the food is still worth the trip and Theresa is a gem. Cool! Green Chile Stew is my favorite. Glad they're still happening. Thanks for the tip blackirondude. We have a trip coming up to New Mexico and we are putting this on our list.